Once upon a time, there lived a small, colourful elephant. He was only 4-years-old and he had just moved to his new house in the enchanted forest. His house was very big, to fit his large family in, with an enormous bath because he loved bath time most of all! 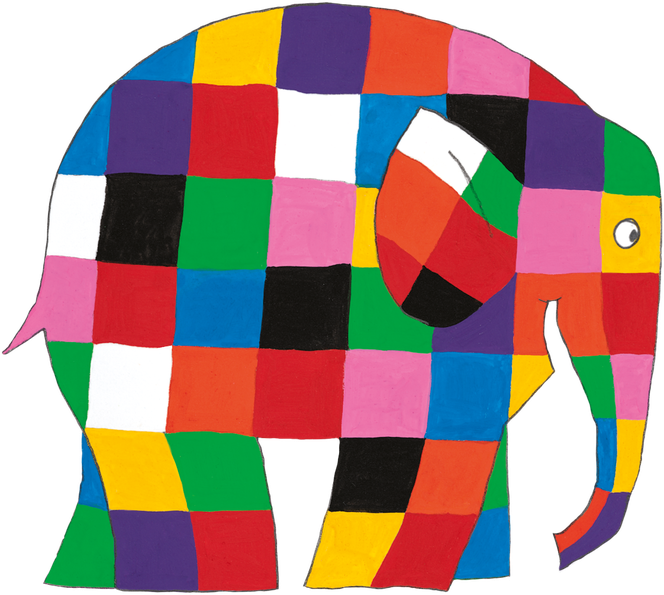 His name was Elmer and he was very different to the other elephants in his family because his skin was every colour in the rainbow. One day Elmer was very sad and didn’t want to get out of bed. Elmer told his mummy that it was because he hadn’t made any friends yet so he didn’t know who to invite to his birthday party. Elmer’s birthday was in five weeks and he was worried that nobody would come. After a few hours of thinking about how he could find friends, Elmer decided to take a walk through the enchanted forest to see if he could find any friends who were animals just like him! He packed his bag ready for his great adventure through the forest. When he was ready, he started stomping through the forest, listening and looking around for creatures: big and small; hairy and fluffy; and most of all a kind, happy animals who would be the best kind of friends. After a few minutes of trying his hardest to quietly stomp through the crunchy leaves, Elmer heard a loud noise. Someone was sobbing and snivelling, Elmer wondered who it could be so followed the noise until he arrived at a magnificent, peaceful waterfall. Birds were singing in the trees and butterflies where flying high and low. To Elmer’s surprise he saw tiny, beautiful, delicate fairies weaving in and out of the trees, spreading their fairy dust on the magical waterfall. He then looked down at the water pool and saw a big, grey hippopotamus sat on the floor holding his leg tightly while tears ran down his cheeks. Elmer rushed over to the hippo and asked, ‘Hey, are you okay, what’s the matter?” In a quiet tone the hippo replied, “I hurt my leg on the side of the rock when I went for my bath in the pool!” Elmer replied, “Oh dear, my names Elmer and I know just the person to help you with your leg, what’s your name?” The hippo told Elmer that he was called Harry and with Elmer’s help, he pulled him up by his trunk and they slowly walked to where, Vet Lenny the Lion lived. Elmer explained that when he was hurt his mummy took him to the vet and they made him better. After a while of walking they arrived at the vets and Vet Lenny bandaged Harry the Hippos foot up and they were on their way again, both now much happier. Elmer told Harry all about his party and they decided they would go and find some more friends, who could come to the party. After a long walk through the whistling trees, they spotted a very sad Giraffe, who appeared stuck in a large sand pit. “Help, help, I can’t get out!” said Gerry the Giraffe. They quickly told each other their names and said we will help you. Then they quickly rang the police, fireman, vet and reporters to come to the scene quickly. The police men and firemen could be heard racing through the forest with their extremely loud sirens. The police men taped the area so no one else would get stuck, the firemen used their long ladders to pull Gerry the Giraffe out, the vet was there to help Gerry if she was hurt and the reporters where filming their news programme telling all the other creatures in the forest what was happening. Finally Gerry was freed from the terribly sticky sand pit and luckily was not hurt. She thanked Elmer and Harry the Hippo and instantly they all became friends. Elmer took Harry and Gerry back to his house for some tea as it had been a very long day, they enjoyed a great feast and talked about his birthday party. Gerry then explained that when it was her party, her mum got the best party planner in the whole entire forest to plan it. Elmer jumped up in excitement and immediately asked, “WHO, Who is it?” Harry knew who Gerry was talking about and they both replied together, “The GRUFFALO!” With no hesitation, they quickly finished their dinner and set off on the hunt for the Gruffalo. They passed many creatures, asking if they had seen him, describing him to them. Until, they arrived at the little mouse’s house (the Gruffalos best friend). They kindly asked the Gruffalo if they could help Elmer plan the best 5th birthday party ever! The Gruffalo agreed and all 5 creatures – Elmer, Harry, Gerry, the Gruffalo and the mouse- quickly got to work planning, decorating, cooking and writing invitations to all the creatures in the enchanted forest. Days passed and they continued to be busy, rushing around, putting the decorations up and getting all the food ready. On the 19th October, Elmer woke up in excitement because the day had arrived and he was now 5 years old! Once he was dressed, he rushed down stairs to find all his friends and family gathered for the special party. He had a marvellous day and thanked his best friends Harry the Hippo and Gerry the Giraffe for all they had done in finding the Gruffalo and giving him the best party ever!